I ran across Lauren's Saturday Sketch and thought it would be perfect to use with the Bloomin' Beautiful set and Afternoon Tea DSP, that is still sitting on my desk....I stamped the image in Black Stazon on white card stock, then punched it out with the Marvy Giga Punch. 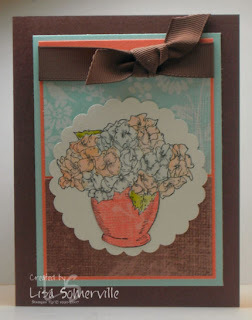 I used the Afternoon Tea DSP to paper pieced the vase, then colored the flowers with Groovy Guava and Soft Sky ink. This is just beautiful! Luv everything about it. Oh that is just SO pretty! I love that image and the soft colors! Lisa love the mutli colors on the image. Now I want that DS paper.